Black★Rock Shooter is based on characters illustrated by huke. The illustrations caught the eye of music producer Ryo who then created a song based from these illustrations with his collaborative Supercell. This song's title would then become the inspiration for the anime, Black★Rock Shooter. The anime was awarded the Technical Achievement in Broadcast Animation at the 65th Motion Picture and Television Engineering Society of Japan Awards in 2012. It also received a video game adaptation for the Playstation Portable, as well as a few browser games and guest appearances in other popular video game franchises. Black★Rock Shooter would be the last time that I will ever watch with the name Mari Okada in it. I should have learned my lesson with the pile of nonsense Fractale, but nooooo! I JUST HAD to watch this until the end. Okay, I admit, not all of it was bad. For starters, the use of CGI in this anime was superb. I mean, really. I think BRS established a new standard in me when looking at CGI in anime. The fight scenes were well-made, and the level of violence put in here is nothing to laugh at. BUT, I’m afraid everything else just felt… ridiculous and pretentious. I think Mari Okada has a tendency to place unusually large values on topics that don’t really matter and focuses the attention of her writing into creating some of the most angsty anime to ever grace television screens. Fractale had a lot of this that I won’t even bother pointing out. Ano Hana spent too time showing that the character’s couldn’t move on from Menma’s death, as well as OMG IT’S SO SAD LET’S ALL CRY scene from its eleventh episode. BRS had all of this unjustified insanity, characters whose actions don’t make sense, and yes, one of my most hated things about anime, glorifying trivial subjects. As I said, BRS used insanity very poorly. It’s like asking a fifth grader to write how he thinks insane people act. It’s unnerving, but not quite believable. Let’s take for example Kagari’s behavior. Okay, fine, she was creepy and all that, but I just couldn’t shake off the feeling that there’s something amiss. She felt less like a disturbed person and more like someone feigning insanity to get away with a crime. The same can be said about everyone else. The characters’ actions do not make sense. Why would Yomi’s mother tolerate Kagari’s outrageous behavior toward her own daughter? Why would Saya torture students who weren’t even involved with her problem (Kohata)? How did they know for certain that Mato was BRS, Yomi was DM or Kagari was Chariot? A lot of other questions remain. This is like Fractale all over again. As with Ano Hana, I had a lot of trouble trying to sympathize with the events of the story. In the end, the anime ended up being about saving Yuu from the other world. That much is clear. My only problem with this is that the way they did it was so bad. It felt empty. I couldn’t really describe it, but I was so frustrated while I was watching the final episode that I even considered dropping it then and there. It’s the same feeling that I had with Ano Hana. I just don’t like it, and I won’t bother trying to find out why. All in all, I think Black Rock Shooter could have been much, much more. All of the flaws I have pointed out can all be traced back to the writing. If this show had a different writer, I think a lot of the problems with this show would not be as frustrating as they had become. Sure, the angst will still be all over the place, but at least it won’t be Mari Okada Angst. 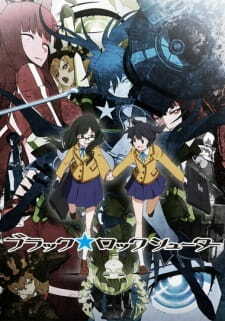 I give Black Rock Shooter TV my personal MAL rating of 5, which should have been a 3 if it wasn’t for the cool CGI. In the 1960s, which is 60 years before when I come from which is the future, a recondite avant garde composer by the name of Captain Beefheart graced the airwaves with his trundling avant garde music that challenged the status quo of blues music with a menagerie of outré bumps and scrapes, replete with a healthy dose of guttural growls, vaguely resembling music. Yet these renegade evocative soundscapes informed a portent of society. In order for progress to subsist, artistic vanguards like this are of incorrigible necessity. Now, I'm going to go on a bit of a tangent here, so please bare with me. In comparable fashion, the incandescent, avant garde Dada movement was birthed by way of the antipodal reaction to the indelible horrors of World War Un. This international movement was embarked by a collective of adroit artists and poets consummately associated with the Cabaret Voltaire in Zurich. Dada rejected reason and logic, prizing a mélange of nonsense, irrationality and intuition. The origin of the name Dada is difficult to parse; some believe that it is a nonsensical word. Others maintain that it originates from the Romanian artists Tristan Tzara's and Marcel Janco's frequent use of the words da, da, meaning yes, yes in the Romanian language. Another paradigmatic theory states that the nom de plume "Dada" came during a confluence of the group when a paper-ladeden knife stuck into a French-German dictionary happened to indicate a sequence of letters spelling out 'dada', a French word for 'hobbyhorse'. Their greatest accomplishment, however, was paving the way for Black Rock Shooter, and in turn, this highly intellectual essay I am writing. In the avant garde tradition of dadaism, Black Rock Shooter tells the tale of budding young girls coping with the malaise of growing up by way of nigh-poetic alternative reality battle sequences. These obstreperous alternative reality segments, an oneiric substrate of the recursive subconscious, serve as a brilliantly heuristic amalgam: the asynchronous parallelogram that is the human mind is an esoteric and, at times, untenable beast; one that Black Rock Shooter, in all its thematic opulence, seizes magnanimously, spinning it's own immutable and immaculate web that, while subtly didactic, masterfully explicates the manifold human condition on the precipice of the acquiescence of maturity with a very natural demure about it. In the words of Lester Bangs, "Every great work of art has two faces, one toward its own time and one toward the future, toward eternity." Well played, Mr Bangs. Well played. And if you'll bare with me for a bit longer, I'd like to expound upon what a "character" is before diving headfirst into Black Rock Shooter's puissant ensemble cast. To cite wikipedia: "A character is a person in a narrative work of arts (such as a novel, play, television show/series, or film). Derived from the ancient Greek word kharaktêr, the English word dates from theRestoration, although it became widely used after its appearance in Tom Jones in 1749. From this, the sense of "a part played by an actor" developed. Character, particularly when enacted by an actor in the theatre or cinema, involves "the illusion of being a human person." In literature, characters guide readers through their stories, helping them to understand plots and ponder themes. Since the end of the 18th century, the phrase "in character" has been used to describe an effective impersonation by an actor. Since the 19th century, the art of creating characters, as practised by actors or writers, has been called characterisation." That is what a "character" is. Now you "know". Tu m'étonnes. And the "characters", ahh the "characters"…!!! So many "characters", so many "feelings". As I consider it, nigh all of them are connected. In point of fact, the teacher is as well. Mato, a protean Humbert Humbert of sorts, is our intrepid protagonist. Feebly equipoised, Mato is a veritable "domino theory" of emotions. Everything from :D to >:O is covered consummately, leaving no stone left unturned, n'est-ce pas! In no other piece of fiction has the kaleidoscopic array of humanity been so thoroughly covered, and with such nuance to boot. Astute viewers will be on the edge of their seat as Mato confronts inherently relatable, quotidian issues, such as being dealt the "dirty colored macaroons" by a periphery, recalcitrant acquaintance; clearly a profound yet subtle metaphor for fate and one's lot in life. This essayist is pleased to report that you can expect many more ruminations on life like this promulgated throughout, so please be gently with everyone. Case in point, Black Rock Shooter, Mato's acousmêtre alter ego, is in constant conflict with an elusive, Kafkaesque clout beyond her control; a startling depiction bureaucracy that rivals such notable works as "1994" and "Brave World" in its deft, metaphysical illustrations. Furthermore, White Album 2 uses many emotions to bring out emotions. These emotions then show us the emotions of the characters and hence develop them and give us emotions as well while watching this. Veni, vidi, vici. Captain Beefheart would be proud. il y a quelque chose qui cloche métro, boulot, dodo Liberté, Égalité, Fraternité. Yuri factor, however, is a paltry 4.2793/10. Mere inklings of shoujo-ai allusions are all that await you in Black Rock Shooter, in terms of yuri. Don't assuage, however. Abide. Besides, are yuri main for you? This is my second review ever written and this contains solely my opinion, i apologize in advance for any grammar mistakes you may find while reading it. Wow this anime, as i'm scrolling through the reviews it's like 2 different worlds (no pun intended) i see half of people rating it at 1-3 and the other half rating it 9/10. To be fair most reviewers just end up giving it a 5, I guess you could call that neutral, neither a masterpiece nor utter garbage, but i feel the need to give some credit to this anime and am going to state all I think about each aspect of it. To be fair enough i can see the enormous plot holes and missing links through out the story. It's not a very long anime, however it goes goes deeper into the characters, giving each of them a more complex personality as oposed to the OVA where everything's just happening and flying across your screen out of the blue. This story is far more fullfilling than the OVA as it gives us more knowledge about what is going on, who are these Black Rock Shooter, Dead Master, Strength, etc. and it gives us an origin and what they are doing in their world, and finally what is the actual correlation with the real world. The thing i didn't like was that the anime fails to connect the pieces, it kind of follows the same path as the OVA and just throws random new characters in your face, most of them kind of stereotypical and they're just there to fill in the plot and give the main character some obstacle, something to fight against, and it doesn't even make full sense the way the series explains what the fighting is all about and are these girls the only people with these abilities, they just out of nowhere gained them and suddenly can see different worlds? The story was more interesting than the original but i have to give it a 6/10 for the plot holes and just the lack of connection between each event. This is one of the strongest aspects of the series, now i'll have to divide this into 2 categories since half of it is 2D art and the other half is 3D and uses a lot of CGI. As far as the 2D art goes there isn't anything particular, i disliked that they used a lot of dull like colors in the characters not brighter ones but i guess it somewhat fits the atmosphere. The CGI however, this is where this series gets its value, the fighting scenes, the laser beams and pretty much the whole other world or whatever you wish to call it is beautifully designed and i know it takes a lot of work to do it in 3D, each world of each "girl" has its uniqueness and it's just amazing to see the visual aspects of each. The combining of the 2D with the 3D makes me give it an 8/10 because i just was thrilled with the 3D visuals even if that doesn't equal the full runtime of each episode it's pleasing to see. This can be argueable but i think the characters are in a way kind of stereotypical, as far as the real world goes the plot can be put simply as: Main female lead which the episodes focus on, best friend who gets jealous easily, best friend's overprotective friend, friend who is hated by others for being friends with the main lead. This is just too typical for me to accept as fine, i don't believe in any way that a situation so stereotypical and usual can lead to such a catastrophe (which is what the anime makes it seem like) which is also the excuse the anime uses as some sort excuse for the existence of the other world. The characters each have different distinct personalities but it's just too typical it doesn't bring anything new to the table. The "other girls" in the alternative world don't really have a personality of their own so i can't really judge them. Also i can't give points fo the main lead who seems like a helpless defenseless girl that is dense about everything and can't see what's wrong, just no, enough of these generic characters. My overall score for this anime is a 7/10, plot holes and an uninteresting generic plot of 4 school girls annoyed me the most, the fighting and the action with the use of beautiful visual art and CGI in the alternative world are what i think makes this anime watchable and worth something so i believe it goes above average but it's not a masterpiece, hate me if you want but that is how I see this anime. It was absolutely unpredictable for me. Maybe, people who watched OVA can find some spoilers in it, but I think that scenario is great. It's quite interesting story about hurting, friendship and parallel world. Actually, "Black Rock Shooter" has two or even three parallel plots. Fantastic graphic. Each episode was really incredible from graphical point of wvew. Both real and parallel worlds are painted carefully and stylish, that means, in two different styles. I don't know what to say about it. Maybe, I put nine for sound because I saw the "Puella Magi Madoka Magica", where sound work was really outstanding. There sound is also good, but not the best I seen ever. Many characters, many feelings... How to write about it without spoilers or foolish speculations? Each schoolgirl has each own personality, and each teacher also. Practically all characters are connected together. Battles is the only enjoyment there, because other parts of this series are very serious and sad. But... are enjoyment main for you? The "Black Rock Shooter" was expected to be catching, but nobody expected so catching eight-episodes anime. You need to watch it (of course, if you are ready not only to see but also to think). Black Rocker Shooter. Good Anime or Not? With an anime adaptation, an OVA and a video game, there is no denying that Black★Rock Shooter is a successful franchise. The franchise spawned a fair number of figures, and we are here to help you choose just the right one for your collection.